A sorcerer king, his wise advisor, and a young woman hiding her growing powers race to find an ancient power once thought lost. The power to control the universe... or to destroy it. Gudrunn, entrusted with one of three magical artifacts, amplifies his terrifying power and quickly elevates to become the sorcerer king of the planet Gramadon. He seeks a rarity still protected by its people, even from him: an unhatched Dragon egg just waiting for the next dragonrider. Meriaus, native to the planet Gramadon, believes he can guide the sorcerer king to make the universe a better place. Yet, the power of the Enixar soon twists his master’s mind. No one can stop him... no one except his trusted advisor. Amadalia loves her grandfather, the sorcerer king who believes in her and understands her true potential: the potential to inherit his throne. Training in secret proves to be her best weapon in the battles to come. 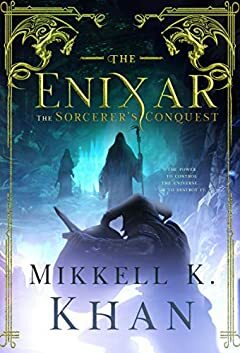 THE ENIXAR: THE SORCERER’S CONQUEST is a novella and dynamic introduction to an epic fantasy series you won’t be able to put down! Complete with a strong female protagonist, Sorcerer King, and political intrigue, this series dives into the core of Epic Fantasy and Science Fiction that fans will love. Scroll up and one-click today! This is the first instalment of the ongoing series, The Enixar. This book is intended for a young adult to adult readers. It contains some graphic violence. This book does not contain explicit sexual content.